If you are looking for something less, something different, something under four-thousand feet in elevation, look no further. Though trust us when we add that sometimes less is actually more. In other words, some of the mountains on this list, while under 4000-feet, are really quite challenging featuring long hikes on tough trails — some terrifying — through wild, untamed forests. Some of the NH 48 4000-Footers are actually easier than some of what hikers will encounter completing the “52WAV” list. That said, this guide will help you along the way. Whether you have hiked all of the 4000-footers, and are looking for more summits, or you are just getting into hiking, crossing the mountains off this list is sure to be an incredible, indelible experience. What Exactly is a “52WAV” Mountain? 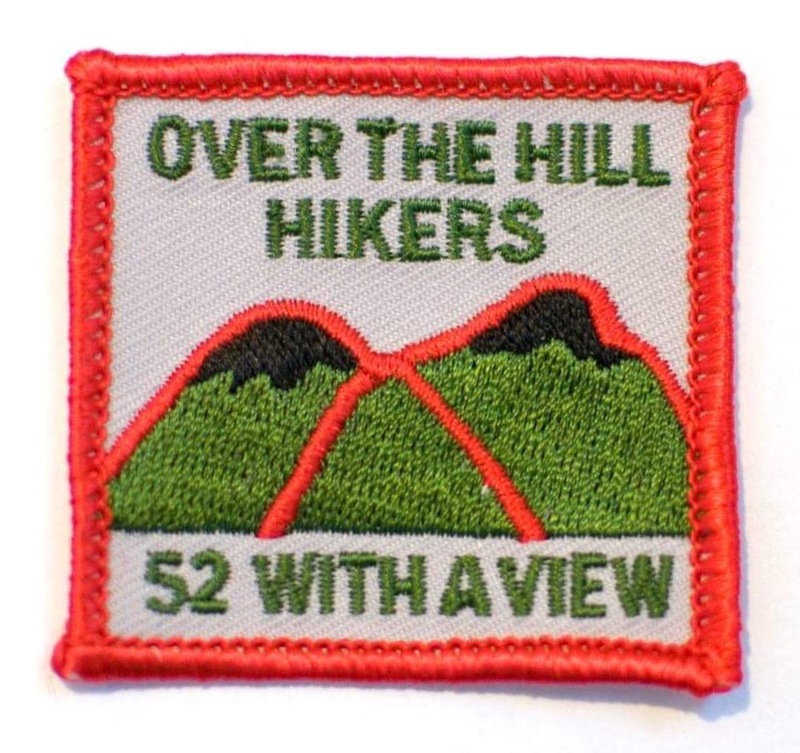 The 52 With a View list (also known as the Over the Hill Hikers list) contains fifty-two mountains with elevations under 4000 feet [but are over 2500′] and have incredible views. The Baldfaces: the South and North mountains — respectively #8 and #7 on the list. Photo courtesy of Ken MacGray. The mountains on the list below are shown from tallest to shortest, complete with a few briefing notes on each. All mountain names in the list link to specific pages on the various websites, each offering more detailed information. You’ll want to read each page thoroughly, and be sure to get a map (and know how to use it) before hiking any of them. Also known as Sandwich Dome, this is the tallest 52WAV peak. The views to the north are fairly stunning but one of this mountain’s most beloved virtues are its beautiful trails. For example: Bennett Street, Algonquin, and Black Mountain Pond Trails are all gorgeous — although the latter two are quite challenging. Most hikers will go at it from the Sandwich Mountain Trail so they can bag Jennings Peak (#13) along the way for a twofer, and most will involve Drakes Brook Trail to form a loop, but that just means there’s are reasons to come back. The goal of this hike is to summit the mountain. This is one cool mountain with endless, dizzying views into the depths of Crawford Notch along much of the way — if you hike in via the Webster Cliff Trail, that is. This section of the Appalachian Trail (AT) is one rugged stretch. If you want to make it easier, access the summit via the Webster Branch of the Webster-Jackson Trail to the aforementioned cliff trail. The goal of this hike is to summit although it has much more to offer if you’re up to it. If you’re the typical peakbagger, you’ll walk right next to the Starr King summit on your way to Mt Waumbek via the Starr King Trail, which is one of the easier NH 4000-footers. It’s only a mile further, in fact (two miles ’round trip). While this summit does rise above many of the others, the easy grades make it an easier hike than most. The goal of this hike is to reach the magnificent viewpoint at the old cabin-site just beyond the actual summit. The Horn is located along the northern part of the Kilkenny Ridge and is often hiked along with The Bulge and Mt Cabot, the latter a NH 4000-footer. The Horn features great views atop a challenging rock nub. This northern peak lies in an area where you will likely find a lot of moose sign, absolute silence, and far fewer people than on many mountains. Access is normally via the southern end of the Unknown Pond Trail (because most are hiking a loop to get Cabot) but the northern end is a bit easier. The goal of this hike is to summit the tip of the horn. Beyond Mt Moriah (a NH 4000-footer) the Moriah Group range continues east and after the Rattle River Trail (AT) things take a sudden turn for the secluded edging along the Wild River Wilderness. Aside from redliners and those hiking this list, not many continue eastward. Those who do, however, are in for a treat. A quiet, expansive summit offering sweeping views. Easiest access is via the aforementioned Rattle River Trail, but other ways exist… all involving respectable mileages. Not to be confused with the Maine 4000-footer of the same name or Middle Sugarloaf (#51), this peak is located in the Nash Stream Forest north of the Pilot Range in Stark, NH. It’s a northern peak that sees comparatively few visitors due to being so far out of the way. It’s a rugged mountain, the Sugarloaf Mountain Trail eventually climbs as if it means business, but it rewards its visitors with unbroken views for miles around. Access may be much more difficult in winter. The goal of this hike is to summit. Rugged, challenging trails and great views of Maine and New Hampshire, that’s what the Baldfaces offer (also see South Baldface, #8). Most folks hike both in the same shot ideally ascending South Baldface via the Baldface Circle Trail first then, for ease of descent per our suggestion, heading down via Bicknell Ridge after leaving the north peak to the east — instead of heading down the Circle Trail. The Baldfaces are arguably some of the prettiest mountains on the list. And some of the toughest. The goal of this hike is to summit. Ambitious hikers can do even more that, though. See South Baldface, next, for more ideas. Of the two Baldfaces (see North Baldface, #7), we prefer the south peak via the Baldface Circle Trail, though our joy begins as soon as we reach Baldface Knob (vantage point of photo above) on the mountain’s shoulder. The ascent from there is more gradual and the entire experience is one massive, endless, breathtaking view. Not to mention the cool geology. As we mentioned, those ambitious enough can get a lot done visiting not just the north peak (above), but by simply modifying the routing, they can also grab Eastman Mountain (#34), Eagle Crag (#30) on Meader Ridge, and West Royce (#22) on the same very tough hike. The goal of this hike is to summit. Being a Mahoosuc Range gem this peak has lots to offer. First, if accessing the mountain via the Success Trail, there’s an “Outlook” loop worth detouring to, then the summit plateau itself features alpine bog bridges — a staple on the Mahoosucs — and is simply breathtaking. And then there’s the plane crash… certainly worth exploring if you can find it. It’s located not too far south of the summit (.2), off the Mahoosuc Trail (.1) on the eastern AT boundary swath. The goal of this hike is to summit. Be warned, however, “Mahoosuc miles” may differ from ordinary miles. This seen-first rocky knob is iconic and highly recognizable. From afar or close up, Chocorua [shō-CORE-oh-uh] doesn’t disappoint. It’s right up there with the Baldfaces in terms of mountain beauty and vast expanses of open rock, though do expect many more people on Chocorua. The beautiful mountain also rivals or even surpasses the Baldfaces in terms of trail difficulty but it depends on how you go. Hiking up via Champney Falls — allowing getting Middle Sister (#18), too — or Liberty Trails may be preferred over some of the more challenging, scrambly, even dangerous options. That said, those other trails are fun with the right level of confidence and may be a reason to come back. The goal of this hike is to summit this amazingly beautiful mountain. Stairs is one of the most unique mountains to look at from the distance, especially from any angle that reveals the “giant stairs.” This mountain feels very isolated, quiet, and is usually uncrowded. The goal of this hike is to take the spur trail to the east end of the mountain which terminates atop the top step. There, for those prepared and in the know, is a Presidential/Dry River Wilderness tentsite. One that rewards its visitor with an amazing sunrise. Stairs, like some of the others, is a sure favorite. It may be cominbied with various other mountains in this pretty area like Crawford (#28), Resolution (#15), or Parker (#31), depending our your route. For the best views overall, we suggest going in via Davis Path, but many options do exist. Peakbaggers often access Avalon on their way to Mt Field (a NH 4000-footer) via the aptly-named Avalon Trail, taking the steep spur to the rocky tip that serves as its summit so as to grab a view and take a break. It is, however, worth a visit on its own. This short hike requires some muscle but it’s so worth it. There you’ll be perched high above Crawford Notch with Mt Willard (#38) to your left. The goal of this hike is to summit. Energetic hikers may choose to grab nearby Mt Willard (#39) while they’re in the neighborhood. As was noted, Jennings Peak is often grabbed along the way to Sandwich Dome (#1) via the Sandwich Mountain Trail though it could be a destination unto itself. It’s a small, restricted outlook on a tiny knob of a wooded summit, but its views are unique and beautiful. The trail is thought to be strenuous. The goal of this hike is to reach the rocky outlook near the mountain’s top. Like Sugarloaf Mountain (#6) the Percy Peaks live in the Nash Stream State Forest to the north. Two near-twin mountains, neighbors. Only one, however, is trailed and counts, the north peak. Access is via the steep, challenging Percy Peaks Trail and the exposure on the steep, ledgy summit mound is significant. But also magnificent. These mountains feel remote and are. Expect more difficult access in winter. The goal of this hike is to the north summit, but many grab both peaks accessing the south summit by an easy-to-follow herd path. The actual summit is located a bit off of the popular Mt Parker Trail which you’ll likely access via Davis Path, but it’s easy to locate following any number of meandering ledge paths leading to the high point. This deep wilderness mountain affords myriad views depending on where you stand, and any where you stand will feel special. The whole Montalban Ridge shares this vibe. Very few people, a soundlessness, and that remote feeling with beauty all around. Folks hiking this mountain may grab Stairs Mtn (#11) and sometimes Crawford (#28), too, or Mt Parker (#31) depending on the route selected and objective. In any case, the goal of this hike is to get as close to the summit as possible while being sure to stay on rock. This is the northernmost of the mountains on this list. Way up north. Hours upon hours of driving on paved roads, then a grueling drive on unpaved roads to finish you off before you finally arrive. Stretch the legs by hiking the wide Coot Trail .8 up to the summit (take Bobcat Trail down), climb the tower if it’s open, then be sure to hike north on the short Outlook Spur found behind the cabin as that will reveal that mountain’s secret: an amazing view of a crumbling cliff (that you’ll be standing on) and giant talus field on the east aside of the mountain. We will tell you that that is the goal of this hike, not just the summit. Do grab the White Mountain Guide Book and read up before leaving the area. There are a number of other hiking trails throughout the Connecticut Lakes/Pittsburg area. An oft-stated impression from hikers is that this mountain can be tough. It seems to demand a lot, then it gives only a little when you arrive at the summit. As you linger, though, and your heart rate slows, you realize the small gift is actually huge as you peer into an area west of Bear Notch Road. There’s very little out there. The Kancamaugus Hwy (Rte 112) separates you from the Sandwich Range but you cannot see this and nature becomes seemless. The goal of this hike is to summit and this is generally done from the east on the Mt Tremont Trail, but another, albeit much tougher option from the west does exist. 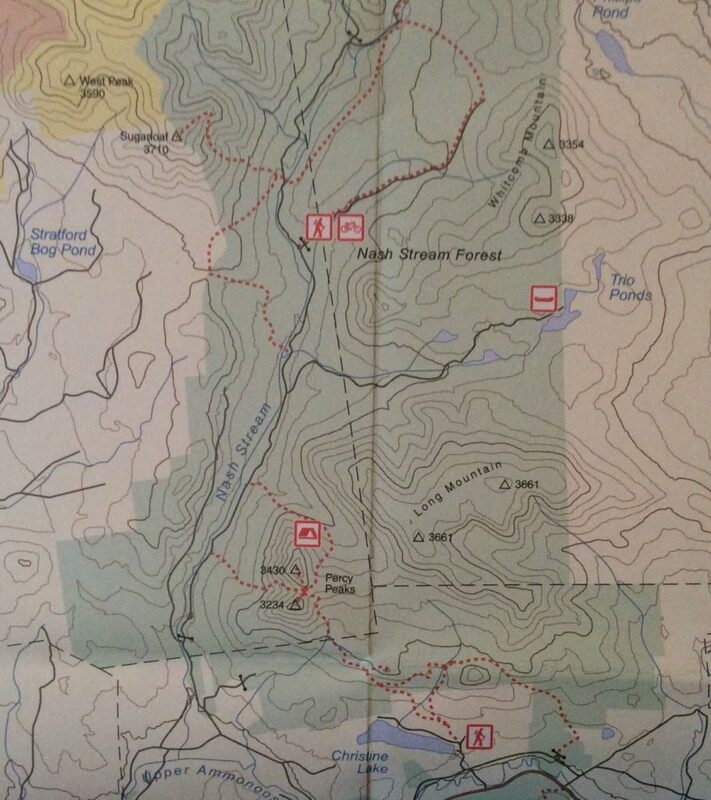 Middle Sister is often hiked in conjunction with Mt Chocorua (#10), recommended if approaching from the Kanc via Champney Falls Trail, though taking Carter Ledge Trail from the east can be fun but be warned, it’s sketchy. The summit offers amazing panoramic views and an amazing perspective of Chocorua itself. It also features a stone remnant of a tower. Also squatting on the summit (last we were there) was a USFS radio repeater. The goal of this hike is to summit the mountain. Imagine a beautiful summit with sweeping views, add a lookout tower, glass all around protecting its occupants, then add a catwalk with a white picket fence around it. That accurately describes what you’ll find on this rock and fir summit. It made a fine mountain on which to be married on for the author (Mike). This mountain, not to be confused with Mt Kearsarge (#35), is obviously prominent and quite distinguishable as a landmark in the Mt Washington Valley at a distance. The two trails reaching for its summit offer completely different experiences. From the east, Weeks Brook Trail is seldom used. It’s longer. Most ascend via the Kearsarge North Trail. The goal of this hike is to summit. Naming conventions here keep hikers on their toes. First of all, Mt Martha is one of two summits on Cherry Mountain, the second being Owl’s Head — not to be confused with the 4000-footer of the same name. Second, the elevation of the lesser peak is used for placement on this list. Otherwise, Mt Martha would be in the 10th position at a towering 3563′. Need more conufusion? The trail connecting the two peaks, Martha’s Mile, is only eight-tenths of a mile long. Don’t dwell on any of this, though. Hike up via the west end of the Cherry Mountain Trail, then hike out to Owl’s Head, then either backtrack or have a car spotted at the north end. The goal of this hike, just so as to avoid even more confusion, is to hike to both summits. This is the first bigger mountain AT thru-hikers encounter in NH when entering from Vermont to the west. This is via the Lambert Ridge Trail which features a worthy outlook on the way up. At 2700′ an old fire warden’s trail, Ranger Trail, joins and many return via this route to mix things up. Those even more adventurous and capable can continue on the AT going over Mt Cube (#36) as well some six-plus miles away. The goal of this hike is to access the summit outlook ledge and old fire warden’s cabin. There is also a summit tower with 360° views. From number 21, above, we shoot as far to the east in New Hampshire as we can, almost into Maine to find this, the eastern-most mountain on this list. Deep in the heart of Evans Notch this mountain sits quietly away from the hustle and bustle of other ranges. Access is easiest from the west using Burnt Mill Brook Trail, but there are good east-side trails to choose from as well. Additionally, one can combine this hike with Eagle Crag (#30), the Baldfaces (#7 and #8), maybe even Eastman Mountain (#34). It is often hiked in conjunction with East Royce across the Maine border. In any case, winter access will be tougher. The goal of this hike is to summit. The goal of this mountain is to reach the main outlook ledge at about 3100′ via the Lawrence Trail but the truly adventurous may decide to actually fight thick firs to locate the true summit about .3 away just so they can sign the notebook found in a glass jar hanging in a small tree. Or not. This remote Sandwich Range mountain isn’t easy to access thanks to its central location, but the strongest, most creative hikers maybe be able grab other listed peaks while “in the neighborhood” such as Mt Hibbard (#33) and Square Ledge (#50). Do bear in mind we are using the term quoted above very loosely. If your tourist walk to Diana’s Baths in North Conway raged out of control, it’s possible you could end up on the summit of North Moat via the Moat Mountain Trail. Most hikers, the planners out there, however, hike it intentionally and wisely drop a car at the other end of the trail. This way they can hike a classic Moats traverse covering Red Ridge, Middle Moat, and South Moat Mountain (#40), as well. The stunning ridge gives and gives until you just want to weep with joy. The summit of this unmountain lacks prominence, so much so that we cannot think of it as its own peak. That said, the goal of this hike isn’t to reach the so-called summit, but rather to reach a phenomenal view point located just below the summit at around 3100′ featuring one of the most incredible views of Mt Washington, the Northern Presidentials, and of the Great Gulf Wilderness area. Some peakbaggers will tag this particular list item while going after the Carters (NH 4000-footers) if they happen to use the north leg of the Imp Trail in their pursuit. Otherwise, that trail is the best way to access this feature. Get after it. Sources say this mountain recieves more visitors than any other mountain in the United States, including our own Mt Washington. Worldwide, it is said it holds the number two position. Mt Fuji in Japan being the world’s most visited mountain. The reason for this popularity is thanks to a combination of the Monadnock’s proximity to a vast southern New Hampshire/Massachusetts urban area, its own accessibiltiy, its overall prominence, good variety of trails, and a vast smooth rock summit area with sweeping views. The views are often dotted with people in the foreground so don’t hike this mountain if you’re looking to get away from it all, not unless you hike your hike at an oddball hour. As mentioned, there multiple trails offering a lot of repeatability, but for ease of access a good choice is to ascend via the White Dot Trail and to descend via the White Cross Trail. The goal of this hike is to summit the mountain. This is another mountain, like that above, that lives well away from the White Mountain National Forest. In this case Cardigan is situated south of the Whites and to the west of I-93 in Alexandria, NH. Also like the mountain above it offers a slabby rock summit (and what appears to be an inaccessible fire tower), 360° views, and a ton of different trails offering a lot of repeatability . That said, it may be will be less crowded than Monadnock, but certainly far from remote. Access this mountain from the west on West Ridge Trail (easiest option) or from the East using the Clark Trail. The goal of this hike is to summit. Returning from the crowded summits above, we again find ourselves in the Whites and on a very remote-feeling mountain in the Presidential/Dry River Wilderness off of the historic Davis Path. One of this mountain’s notable features, besides its award-winning views of the wilderness, is the presence of significant glacial striations of the rocky slab leading you to the top. 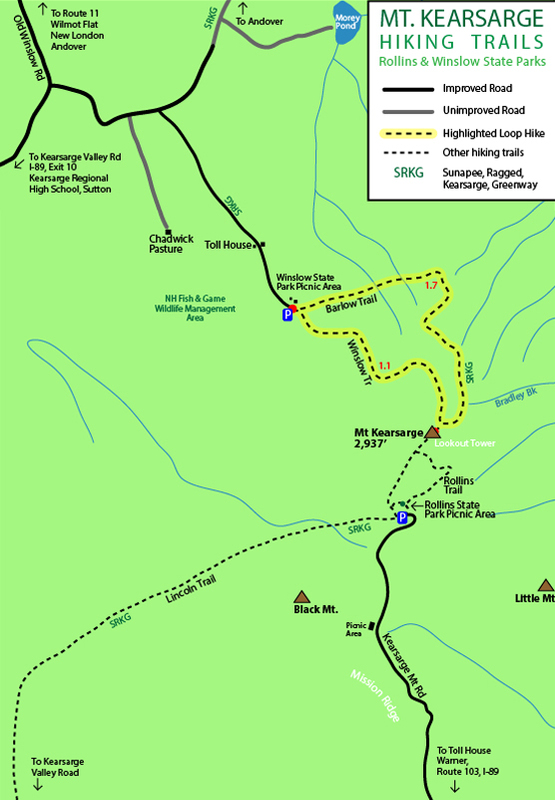 Some hikers may want to extend this short 2.5 mile hike taking in Mt Resolution (#15) and Stairs Mountain (#11) as well. The goal of this hike is to summit. Due to a lack of prominence the real gem of this hike doesn’t stand on its own. We mean North Doublehead’s neighbor South Doublehead (2939′). While there is a great outlook on the north peak, the south peak has multiple viewpoints affording one sweeping vista in several directions. The north peak, however, being the taller of the two, gets the glory. It also features a CCC ski trail and a rentable USFS cabin at the summit which can sleep up to eight people so it does have some bragging rights (Black Mountain (#41) in Jackson also shares these features). The goal of this hike — in our opinion — is to visit both summits. Access is easiest by way of the Old Path Trail with an out-and-back-to the south peak then hitting the north peak and descending via the Doublehead Ski Trail to form a loop. Eagle Crag is often and easily combined with the Baldfaces (#7 and #8) and combining this one with Eastman (#34) and West Royce (#22) is doable for some. This rocky prominence is nestled between North Baldface (#7) and Mt Meader along the Meader Ridge. Though it isn’t the highlight peak of the normal Baldface loop, it has fantastic views in every direction with typically very few people. Some may access this worthy destination directly forgoing the loop and this is best accomplished via the north leg of the Baldface Circle Trail, but we suggest Bicknell Ridge Trail for your descent. The goal of this hike is to reach the crag proper. This is a terrific mountain located at the highpoint of the lovely Mt Parker Trail. It feels remote and in a way it is. Few venture in that direction so solitude and massive views are both close at hand. There are some great options for longer hikes and backpacks — some of which may include Mts Resolution (#15) and Stairs (#11) — though the most direct access is via the Mt Langdon Trail. The goal of this hike is to summit. Here’s another peak that is located more southerly, outside the White Mountains Region. It’s located on the Castle in the Clouds property within the Ossipee Range, and managed the Lakes Region Conservation Trust. It’s easy hiking compared to many of the mountains on this list, many parts like the main access Shaw Trail are just low-angled grassy roads. Hikers can cover some distance, though, especially if including Mt Roberts (#47) or some of the area’s other interesting peaks as well. The Lakes Region views here pretty special and quite unique. The goal of this hike is to summit. As part of the Wonalancet Range within the Sandwich Range Wilderness, Mt Hibbard offers some views into the unlogged old-growth forest between Mts Passaconaway and Whiteface (both NH 4000-footers). We’d also like to tell you about the incredible 360° views but as the author recalls, he had to stand on a boulder and jump up to really get the goods at the actual summit. Better view can be found at a nearby spur-trailed outlook ledge. This no-frills location on the Wonalancet Range Trail may as well be hiked on the way to something else like Paugus (#23) or Square Ledge (#50). The goal of this hike is to reach the view point and summit. Situated just south of the popular Baldfaces (North #7, and South #8), one might think that this peak sees a lot of visitors, but then we remember this is Evans Notch. Popular is a relative term. It’s nothing like Franconia Ridge and the masses one will encounter there. Eastman sees few visitors, just locals in the know about its incomplete but epic views and those with an agenda. While you can access this mountain’s access trail via either end of Slippery Brook Trail, narrow your chances of seeing folks going in by doing it from the west. The goal of this hike is to summit the mountain. This short mountain is highly accessible, with one route, the Winslow Trail, being only 1.1 miles in length, though longer trails and loops exist. The mostly barren and broad slab rock summit features a firetower with 360° views. As is typical with mountains south of the Whites, Kearsarge — which is often confused with Kearsarge North (#19) in Chatham — this mountain have have some big crowds. Count on it unless hiking in the odd hours. The goal of this hike is to summit the mountain. Cube came up as a second-peak option for those hiking to Smarts Mountain (#21) in the western part of the state. Especially for those backpacking as the trail between them is part of the AT. For most the mountain may be accessed more easily from the east on the Mt Cube Trail (AT), but the Mt Cube Section of the Cross-Rivendell Trail is the easiest and shortest. Way to go. The goal of this hike is to summit the mountain locating the old tower site, but you’ll regret not locating the North Peak as those views are even prettier. This small mountain in Rumney features a rocky summit with 180° views and more. The rock also has strata which make it geologically interesting. Aside from this, we decided this is probably a distant “one-and-done” for us. This is a short hike done via the Stinson Mountain Trail. The goal of the hike is to reach the summit and the outlook ledge about 80 yards away accessed via a spur trail. Don’t confuse this Black Mountain with the Black Mountain (#41) in Jackson. While that one offers better skiing and a cabin, this one has more astounding views. This mountain’s summit is expansive affording hikers fantastic panoramic views from gorgeous ledges. It features a great perspective of Mt Moosilauke (a NH 4000-footer) and many other mountains in the distance. The gentlest way up is to take the Black Mountain Trail, but the shorter Chippewa Trail is prettier and offers more views along the way. In any case, the goal of the hike is to summit. It’s situated right next to Route 302 between Crawford Notch and the AMC’s Highland Center, its ledges atop massive walls of rock. The top of the cliff is accessed by the easily graded 1.6 mile Mt Willard Trail. With these features and accessibility make this mountain a busy one, seemingly even on bad days and is highly trafficked by tourists, hikers, and ice climbers. There even been a wedding or two there. While there is no trail to the nearly indistinguishable wooded summit, the ledges are the draw and are in fact the goal of this hike. Energetic hikers may choose to grab nearby Mt Avalon (#12) while they’re in the neighborhood. Like the rest of the Moat Mountain Range, from North Moat (#24), over Red Ridge and Middle Moat, views abound. Pristine forests live to the west, and the developed Mt Washington Valley to the east. Well over one hundred various mountains may be seen on a clear day in literally all directions. The goal of this hike is the summit, but many people will spot a car at Diana’s Baths and, starting at the southern trailhead on Passaconaway Road, hike the whole range via the Moat Mountain Trail. As a hiking mountain, Jackson’s Black Mountain isnt bad, but certainly not a favorite. The middle peak has some incomplete views and the trail isnt stunningly special. As a ski mountain, however, it gets a little better as the “hiking” trail is actually the Black Mountain Ski Trail, a CCC-construct like the one on North Doublehead (#29). There is also a rentable USFS cabin. Black Mountain also features a commercial alpine ski area operating off of its southern peak. There is also a northern summit, and this is the tallest off the three at 3304′, but it is trailless. The goal of this hike is to reach and summit the middle peak. These are proven wedding mountains. The 2734′ Dickey Mountain, the main summit, and the 2605′ lesser Welch Mountain. Welch-Dickey is a classic New Hampshire hike, one perfect for trampers looking to get into bigger mountains. The views are stunning, the hike is considered moderate with gradual gain and a few steep sections that you will feel in our calves. At only 4.5 miles total when hiking the Welch-Dickey Loop Trail (we suggest counter-clockwise), this twin-summit mountain is a must do. We say the goal of this hike is to reach both summits even though you technically only have to reach the higher peak. This is one of our favorites. It’s not a big hike, and the Iron Mountain Trail up to the summit is fairly erroded, but the hike starts in a field with amazing views and there’s a perfectly situated break spot outlook about a half mile in. The summit isn’t a stunner to be sure, but it does make the start of the rest and best. You drop down a couple of hundred feet (which you will have to make up) and begin a shoulder plateau traverse to the southern ledges. The goal of this hike is to reach those ledges, but do be sure to appreciate the quiet, secluded, and pretty hike along the way. For those wanting more, follow the spur .1 before the ledges and head to the site of the old iron mine (for which the mountain is named) to see piles of old tailings. Some people will hike this mountain in the morning, then hike neighboring Hedgehog Mtn (#52), which temptingly starts from the same trailhead, in the afternoon. We warn you that this makes for a pretty long day, though. For many, the Mt Potash Trail on its own is enough, saving Headgehog for another day. Both mountains are fairly easy on their own, and both offer equally nice views from numerous points. The goal of this hike is to reach the summit of the mountain. And get back, of course. Back in the west side of the Whites, over by Mt Moosilauke (a NH 4000-footer), sits the squat Blueberry Mountain with its numerous ledges. The Blueberry Mountain Trail visits ledges on both sides of the mountain, but hiking an out-and-back from the east end is a bit easier and doesn’t involve a second car. The goal of this hike is to reach the summmit of the mountain. Access to this mountain is from the north or south, but the switchbacked Wentworth Trail from the south offers fair ease of access. The road (Sandwich Notch) to the trail which leads to the northern trail can be pretty rough. The rewards at the top are awesome offering some stunning Sandwich Range views. Also be sure to take the Bearcamp River Trail while you’re at Mead Base at the trailhead so you can visit Beede Falls, Cow Cave, and more. It’s a nice warm up or cool down. The goal of the main hike is to summit. Like Mt Shaw (#32) this is another Castle in the Clouds hike in the Ossipee Range. It features a unique look down at the castle as well as views of the mountains to the north. Like Shaw the trails are a mix of grassy roads and easier (than the Whites in general) hiking trails and combining both, while not overly difficult, does result in some miles. The goal of this hike is to summit which can be done directly via the Mt Roberts Trail. Also known as “Indian Head” this beautiful albeit more minor Franconia Notch mountain offers stunning ledge views. This is one the more accessible mountains and is a great starter mountain for hikers. Most folks will take the Mt Pemigewasset Trail — partially because the trailhead is less hidden. That said, the Indian Head Trail is also nice. The two meet at the summit but the more distance trailheads may require a car spot. One of the most notable things we recall about Mt Hayes — which we accessed via the Mahoosuc Trail the first time we did it — was our view of Ice Gulch Path over in Randolph. That said, the summit is beautiful with sporadic views mainly to the west and south, and access to the trailhead assuming crossing the iron bridge over the Androscoggin in Gorham is interesting. Also the probable detour to Mascot Pond and the galena/lead mine to see Leadmine Ledge is worthy. Optionally, the other way to go, via Centennial Trail (AT) but we don’t think it’s as interesting. In any case, the goal of this hike is to summit. Not to be confused with the view point ledge in Pinkham Notch across the street from the AMC’s visitor center — which arguably has the better views — this Square Ledge is located off of Mt Passaconaway (a NH 4000-footer) in the Sandwich Range. It’s not an easy ledge to get to requiring a long hike in. And it unfortunately offers such limited views you may just stand there wondering: Is this it?!. Access is via the Square Ledge Trail (and others… see the map on how to get to it). Since it’s a big day anyway, some hikers will try to also include Mt Paugus (#23) and/or Mt Hibbard (#33). The goal of this hike is to take the spur and locate the best part of what little ledge is there. Expect solitude and a closeness to nature here. While above we told you to expect solitude, that will likely not be the case here. The open ledges of Middle Sugarloaf feature incredible views and this is seen from the road so everyone knows. The Sugarloaf Trail trailhead is also easy to find and located next to some serious summer camping. In winter it becomes a little more substantial adding a couple of miles of road walk to the hike. The trail is steep in places but manageable. The worst section is bridged with a staircase. Many hikers will also hike over to the lesser North Sugarloaf summit which also offer views, but the goal of this hike is to summit the taller middle peak. There is a wooded south peak as well, but it has no trail. Last but not least… or maybe we should say it is last and least since it is technically the shortest mountain on this list. Hmm, we’ll let you decide. We certainly mean to say it’s not least in terms of enjoyment and views. The inlooking views found at Allen’s Ledge (on the west leg of the UNH Trail), those from the summit, and as well as those from the East Ledges are stunning. It’s a quiet, peaceful, pretty mountain, though don’t expect to be alone. Located on the Kanc (Rte 112) it’s too accessible for that. An out-and-back to the summit is pretty short, but the real goal of this hike is to also take in the East Ledges. We suggest following the trail in either direction since it forms a loop. Stronger, more driven hikers may also opt to bag Potash Mountain (#44) on the same day since the two mountains share a single trailhead. Note: Please note that some of these mountains aren’t summited, per se, but their famed outlooks must be reached to qualify said mountain. Note: Due to conflicting elevation sources, we tried to stick with the most current data changing the ordering and elevations as needed. Note: Most of the mountains listed above have multiple trails on them. 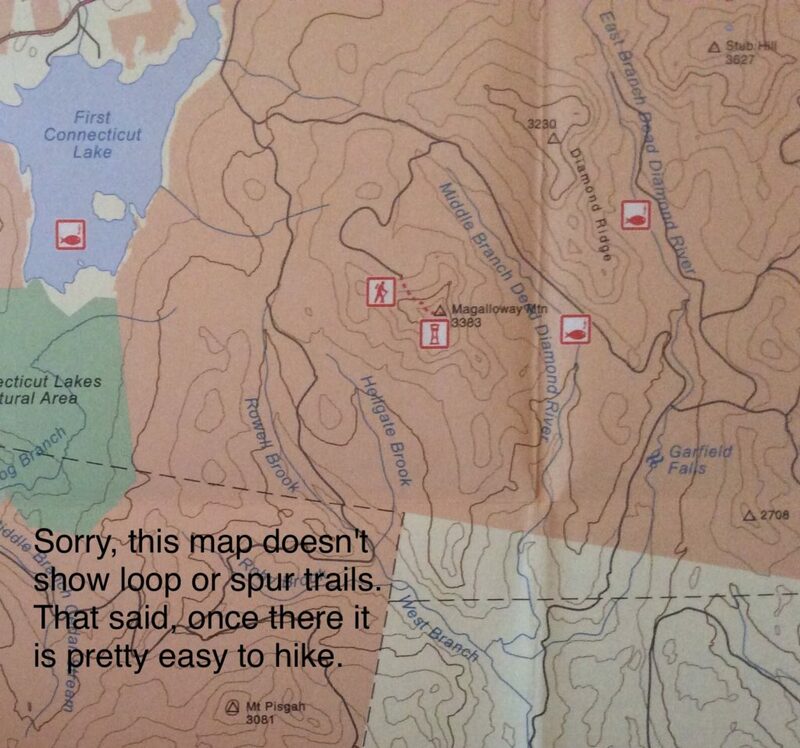 Please refer to a map before setting out. Figure on taking anywhere from a few months to an entire lifetime to complete this list, should you decide to try. There’s no expected rate other than your own. It took the author (Mike) about five years to get it done but he was also working other lists and such and never rushed this one. The order is likewise up to you. Strong hikers can combine peaks that may be too far for some, while others may be just starting out (this is a pretty good list for new hikers if they do their homework). Below we will offer our opinion as to an approximate order, not for all 52, but we will show some that are good to start with and others that are good to save to the end either because they are tough or special or have some other prized quality. Good ones to start with, assuming we’re not combining peaks for now, might include (not shown in any order) the following: Mt Israel, Mt Pemigewasset, Hedgehog, Potash, Kearsarge (Warner), Monadnock, Roberts, Shaw, Cardigan, South Moat, Blueberry Mountain, North Doublehead via the ski trail, or Magalloway despite it being so far away. These might be good choices due to moderate grades, easy, less technical trails, shorter distances, accessibility, and small or no river crossings. Please note, if you’ve never hiked before, peaks like Mt Willard are ideal as not only is the trail easy compared to most, it has lots of people on it. Though be warned, even there water crossings exist. There are no rules here, though you’ll want to consider safety and other things as you progress. Trail conditions, water crossings, time of year, road access, hike distances, etc. The logistics. Since eventually you will have to hike some longish hikes, some more satisfying than others, these peaks might populate your middle mountain list. Try, for example, a whole North-South Moats traverse, Potash and Hedgehog, or a Roberts and Shaw loop if these haven’t already been done individually. Others might include Hibbard and Square Ledge, Paugus, Crawford, Resolution and Stairs, or perhaps Shelburne-Moriah — though some might consider those last few peaks worth finishing on. Consider your priorities. Views, an alpine experience, tough trails with scrambles, solitude? Maybe a sunset or sunrise summit to celebrate. Do you want non-hikers there for your finish? Since no mountains are drive-to and since Iron Mountain has such a stunning trailhead, that could be a good choice (plus you don’t actually finish until you’re down anyway). Or maybe Middle Sugarloaf, Willard, or Welch-Dickey creating easier access for those in need. If a fire tower hike is more to your liking, Kearsarge North or Smarts Mountain might be good. If you want something more grand, you might want to consider saving Mt Chocorua or the Baldfaces — or a whole Eastman to West Royce traverse. Epic. Use the interactive map below to locate the various mountains on this list. Please note that some access roads are unmaintained, close seasonally, or often close for damage repair. Be sure to check the current statuses on Forest Service Roads and other maintained roads (Hurricare Mtn, Tripoli, Bear Notch, etc.). Be in the know, before you go. Before each hike go to sites like New England Trail Conditions for info specific to 52WAV peaks, check water levels if you’ll be doing crossings, and do be sure to check the weather. Options include the Mt Washington Obsevatory, Trails NH Weather (link finds your current location), or whatever sources you prefer and make the most sense for the area you’ll be in. Also be sure when checking the weather that you factor in the mountain’s elevation. Also be sure to check for road statuses (as noted in section above). Also learn other things like Leave No Trace (LNT) so that you don’t make too much of an impact, and learn to Hike Safe (and get a Hike Safe Card while you’re at it), and seek other resources such as those linked to from our Resources Page or blog posts like Starting Out in the Whites, the Five Fundamentals, and others. White Mountain National Forest (plus Guide Book). Mt Cardigan, Mt Monadnock, and more (i.e. Belknap Range). Smarts Mountain & Mt Cube. In essence, wear hiking clothing and footwear appropriate to the season — in the mountains! Visit your local hiking or outdoor outlet. Ask them if they have cotton hiking shirts. If they don’t attempt to tell you cotton hiking shirts are no good and why (holds water, doesn’t insulate while wet, will kill you), shop elsewhere. Find people who know. Learn about the “ten essentials,” then check out our 13 Essentials. We ask that you adopt that as your guide. In any season as it is a better, more comprehensive list of items. Oh, one last important thing to consider: having others. It’s generally wiser to not hike solo, not to say hiking solo is a bad thing, it isn’t, especially in good weather, but if something were to go awry… well (see what can happen), this is but one of the many decisions you may be required to make along the way. It’s not unheard of to join a hiking group, start with the 52WAV Facebook group, find all-knowing hiking friends, take classes, even hire a guide. If you want to be good, real good, this is how it’s done. To avoid insult, injury, or worse… much worse. It’s your responsibility (PDF) to be prepared and do this right. After all, in the mountains, rescue can take hours. In the mountains you really can die while waiting. Not to scare, purely to inform, we ask you to take the time to read two works of fiction, and ask that they stay fictional. Oh, and good luck. Try to stop and enjoy the views, smell the flowers, so to speak. And please remember, that even though the mountains are calling, they will also be there another day. This article is a collaboration between Redline Guide and owner Mike Cherim and HikingAndFishing.com owner Max Desmarais. Info and editing help, plus the 52WAV patch and Baldfaces photos courtesy of Ken MacGray. Thank you, Ken!